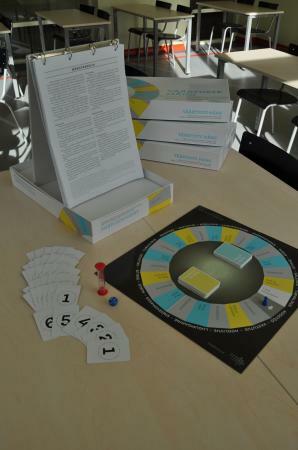 Schools and kindergartens can order the playing of “Values Game” from the Centre for Ethics of the University of Tartu. The game is played in the course of a specific training which provides information about the ways how to successfully deal with values development. The game was produced by Implement Baltic LLC in collaboration with the Centre for Ethics of the University of Tartu (2010). The production of the game was supported by the Estonian Ministry of Education and Research in the course of the national programme „Values Development of the Estonian Society 2009–2013“. Professor Margit Sutrop has written about the method: Sutrop, M (2014). Using the Teachers’ Values Game to facilitate teachers’ reflection on their own values. Teacher Education Advancement Network, 6(1), 55 - 63. - encourage the dialogue among teachers on the topic of values in different situations and value conflicts. The broader aim of the “Values Game” is to enhance the quality of education, school culture and students’ welfare. The focus of the “Values Game” is on the role of the teacher and thus, the game is meant for teachers of all subjects and key stages. As the game is played in teams, it presupposes an appointed time and place. Playing the game should be preceded and succeeded by different activities that support the school in its values development policy. “Values Game” enables to hold dialogues on value judgments. It also helps to bring out the ways of behaviour and their consequences in everyday situations. The amusing format of the game is inspired by an ordinary board game. In this game as in any other, the players experience competition which makes them concentrate on the game and offers excitement. In the course of the game, each team solves situations that contain different value conflicts. Each team gets feedback to the chosen solutions. The feedback has been compiled by an expert group led by the Centre for Ethics. Through this format, the “Values Game” initiates a dialogue at school, which definitely continues after the playing. The game box includes the description of basic values, the values game, instructions for playing and practical recommendations for using the game. The game is based on the self-analysis model of schools which contains the most important principles of values education. The self-analysis model was created by the Centre for Ethics in collaboration with partner schools and experts. Partner schools were also involved in the creation of the game. Implement Baltic LLC gave us advice on the methodology of the game. The game was tested by Jõõpre Primary School, Lindi Elementary School, Kostivere Primary School, Miina Härma Secondary School, Oskar Lutsu Palamuse Secondary School, Pärnu Koidula Secondary School, Pärnu Ülejõe Secondary School, Tallinn Kristiine Secondary School, Tallinn Õismäe Humanitarian Secondary School, Tartu Kivilinna Secondary School, Tartu Veeriku School, Tori Primary School. “Values Game” has a serious content and amusing format. It is a tool for initiating dialogue. It looks like a board game and consists of a gameboard, dice and cards. It is played in teams of 5–6 people. The game consists of a number of descriptions of situations that are realistic, derive from teachers’ professional life and contain a values conflict. In addition to the situations, the game includes different alternatives about the ways of behaviour in each situation. All alternatives are explained. An interesting and amusing discussion takes place in the teams. When the team has reached consensus, they will get immediate feedback to the chosen option. The cards called “Risk and chance” and “Know and win” also belong to the game. These cards enable to receive additional plus and minus points. These situations that caused more debate during the game will be discussed further after the game. Watch video: the "Values Game" was played by Halliki Harro-Loit, Marko Ringo, Marju Lauristin, Margit Sutrop, Kauksi Ülle and Tõnu Lehtsaar (in Estonian). Implement Baltic LLC is a management consultancy company which develops and supports organisations’ ability to plan and implement sustainable strategies and innovations with tangible results.